Category: Accident Reporting. 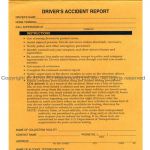 Tag: Accident Documentation Kit. All these items are packaged in a box which can fit in your glove box. A must if involved in an accident to record and take pictures for back up documentation. 1 Digital Flash, 40 Exposure-single Use Camera with Built in USB Cable.